← Thanks, Californians, thanks a lot. Yesterday we had a glimpse of the CDW’s revision of the ICEL text of the Roman Missal which had been approved by the USCCB and sent for Rome’s approval, which it obtained. The revised text was leaked and put on the internet. Furthermore, reports have circulated concerning something like 10,ooo changes made by the CDW to the ICEL text sent in by the bishops. Yesterday, Bp. Serratelli of Patterson, head of the USCCB’s liturgy committee, released a statement addressing the situation. 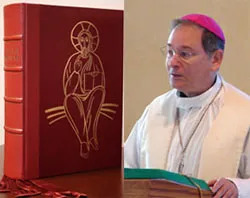 There has been some discussion recently about a report surfaced through some segments of the Catholic Press regarding the present state of the text of the Roman Missal, Third Edition. A number of facts will hopefully clarify the situation and, in so doing, give us the calm needed to welcome and implement the new text. To sum up, there is a final text. It has received a recognitio. As the work of editing and assembling nears completion, there is assurance that the published text will be available in more than ample time for implementation in Advent 2011. It is good to note also that the catechetical preparation for implementation is already underway and has proceeded with much enthusiasm and wide acceptance by both clergy and laity. It is clear at this point in time that there is an attitude of openness and readiness to receive the new text. Let us pray in this time of transition and change that the Roman Missal, Third Edition, will enable all to understand more deeply the mysteries we celebrate. 1) Julius Caesar in his writings laid down important principles for the commander of troops. One of them is that you should leave an honorable escape route for your opponent if you are not in a position to crush him under such huge forces that you cannot be hurt. Bp. Serratelli is saying that the critiques that are circulating are based on a previous revision of the revised ICEL text. There is another, subsequent, revised revision of the revised text. Since this is the case, and even thought the text is now theoretically finalized, the Congregation could quite honorably (quietly, discreetly) correct the mistakes made by the Congregation, pointed out in documents such as the “Areas of Difficulty”. I hope they do. I found myself in agreement with what I read in that “Areas of Difficulty”. If the English version is goofed up – not at all certain – imagine my grief were people simply to opt for Latin because English has been shown by ecclesiastical authority yet again not to be a liturgical language. Don’t like the changes to the new translation? Just say NO! Just USE LATIN! Consider the inexorable biological solution and shifting demographics among priests and seminarians in the wealthier English speaking world. It is in the best interests of those for whom Latin and the older Mass are the stuff of nightmares to do a good job of the English Novus Ordo. If the translation is unsatisfactory, many of the young men being ordained will be happy to use more Latin. People can use whatever translations they prefer. That worked before. It will work again. No priest needs permission to use Latin. We are (most of us reading here) members of the Latin Church. Latin is our liturgical language. 3) What we are talking about is a translation. I, for one, want people to remember that it is a translation. I am therefore happy to sacrifice some beauty and smoothness for the sake of accuracy. If the text sounds like a translation, so be it. I don’t think it is always bad for a translation to sound like a translation. 4) It may be that some of the changes made to the ICEL text approved and sent by the USCCB – changes made by the Congregation – were made with a view to English speakers who are not in the major English speaking countries (USA, England, Australia, most of Canada, S. Africa, etc.). I wonder if the changes we haven’t been happy with are, how to say it, … a way to involve some other regions which aren’t Anglophone superpowers. 6) Even though we are now being assured that there is a final text out there, beyond that which has been munched over on the internet, I think that some pressure should still be applied. The Congregation can continue to make changes… ehem… correct the obvious mistakes of translation that have been introduced up until the minute the “enter” key is pressed to send the text to publishers or to conference heads to relay to publishers. We should continue to scan the orations for Mass in the version of the Roman Missal that we do have, looking for anything that doesn’t work. After all, there is a version out there and the Latin texts are not a secret. If people find things that the Congregation has already properly corrected, nothing has been lost. If people expose changes made by the Congregation that are suboptimal, then a good service will have been rendered to everyone. 7) All during the history of WDTPRS I continually asked people to pray to those involved and even to write letters expressing their hopes for the new translation. I renew that plea now. Pray and even write. Write short – one side of one page – legible, courteous notes a) thanking them for their work and b) expressing your desire that the translation be accurate in its adherence to the Latin original. In past years bishops and Vox Clara members mentioned to me that they had received such letters and that they had been appreciated. Writing such a letter will take you very little time and will cost you very little. It may do a good deal of good if many of you do so. This entry was posted in The Drill, WDTPRS. Bookmark the permalink. Not for nothing, but I feel like there should be a published text right about now. The altar missal, hand missals…. I was at a church supply store the other day and they said they aren’t even aware that a contract has gone out to a publisher yet?! Aside from the few snippets we have here and there there isn’t even a published text at the 1 year mark. We can say, just use Latin, or we can all just finally admit that we can change the translation of the NO Mass all we want and it’s not going to make any real difference whatsoever. Why not focus on real change, and that is enforcing Summorum Pontificum? Every second wasted on this nominal translational change is just further distraction from the big picture. I don’t think liberals are mad about this change at all. I think Trautman and others are thrilled because it takes otherwise faithful, well-intentioned Catholics who should be fighting for the Mass of All Ages and takes their focus elsewhere. Wake up and smell the Mystic Monk Coffee! The CNA article says “Liturgiam Authenticam is a document from the Second Vatican Council concerning the Christian liturgy.” Not so much. I’m wary, I’m concerned, and I wish this process had been much more open and transparent. The best you’ll find are catechetical texts (like my own) which incorporate the 2008 text. I’m not releasing a new edition until I know what the final text will really be. You’ll also find the Order of Mass at the USCCB web site, but that’s probably out of date now too. I admit that I am unfamiliar with the actual workings of the Vatican offices such as the CDW. Will writing a letter to Card. Canizares Llovera truly be an effective means of expressing our thoughts and support for an accurate translation? I’m assuming Cardinal Canizares is not a native or even necessarily fluent English speaker. Also, does it help the cause of an accurate English translation that the Secretary of the CDW is an American Dominican, Archbishop Augustine DiNoia? Does Archbishop DiNoia have any power or say over the final English translation that is sent to be published? I’ve always had a great respect for DiNoia’s intellect and his writings on the Eucharist and liturgy. As a Dominican, I assume he has a great respect and love for very traditional, reverent liturgy (including of course the sacred language of the liturgy). While I certainly love Latin and hope for an increase in the use of Latin even in the Novus Ordo in America, a more accurate and reverent English translation is a necessary step to slowly educate the “rank and file” Catholics (many of whom are still unaware of this impending translation change). Over the next few decades, a corrected English translation can make it easier to slowly incorporate more Latin into the Mass (in much the same way that the EWTN television masses have a mixture of Latin and English). Then the NO and the TLM will slowly but surely move toward each other by Fr. Z’s “gravitational pull” theory. I welcome any thoughts and answers to my questions from those more knowledgeable on such matters than I am. I find it interesting that Bp. Serratelli uses the word ‘slavishly’ considering the subtitle of this blog. I wrote my letter. I’ll mail it after mass this morning. What would be an interesting counter article to this rogue one would be one detailing the inconsistencies of the “old” edition. I’m tired of some people making everything into a NO v. TLM argument. The NO mass is just as much the “Mass of all Ages” as the TLM as are the Divine Liturgies of any of the Catholic non-Roman Rites. I know that there is plenty of room for improvement in the NO mass and that obstacles to SP ought to be removed. I am definitely NOT anti-TLM but it upsets me (to put it mildly) when people disparage the Ordinary Form of the mass. This kind of attitude is one reason I never attend the local TLM. Okay…I’m done ranting. Personally, I’m looking forward to using the new translations. If the Church uses something liturgically, it becomes by that use liturgical. Speaking of correcting typos, there’s only one “T” in Paterson, N.J. I believe the dark night of cheapened Liturgy is over and gone forever. I agree: just stick to the Latin. How much harder we made things than they needed to be when we tried to jettison Latin! Disagree. English is used in liturgy, but it is not a language set apart for liturgical use. If a priest says mass in street clothes, are they then liturgical vestments? I say no. I’m aware…. that’s my concern. This is -or was- supposed to be a done deal. Right now there should be a printed text in our hands, not a couple little snippets of the ordinary. I guess all this just demonstrates that we really are not as far along as we thought. It is interesting to me how some people who comment on this blog, and Fr. Z himself, seem willing to criticize (even condemn), those who disagree with the Vatican’s pronouncements and rulings with which they agree and yet are more than willing to criticize and complain about Vatican approved translations, liturgies, etc that they don’t like. Is this where the term “cafeteria Catholic” would be appropriate? Father Z, on the “review” and “readied,” I feel like this is normal language for any publisher. The review may just be going over the typos and the readied may yet just be setting the letters for the pages. I feel like we are looking too far into these words; the translation is coming, and from what we do know (including the Wikispooks link: https://wikispooks.com/wiki/File:Missal_Received_Text_1.pdf) the translations are pretty well set and translated. I just know anything will be better than what is out now, and as you said, Latin is always an option. While I hope they correct as much as possible, we should be careful not to let the perfect become the enemy of the good. The final version is bound to be a lot better than what we’ve had, and I think it would be more productive if we supported a smooth (or, as smooth as possible) transition to the new text, even if there are some complaints, than if we contribute to the whining and obstruction of the the new text. I guess that depends on whether or not there is a difference between criticizing bad translations and faulty liturgies that erode people’s faith on the one hand, and, on the other hand, refusing to accept doctrines that Catholics are bound in conscience to accept. Answer: there is a difference. The term “cafeteria Catholic” is therefore not applicable here. Patikins, how can a Mass that’s 40 years old, a Mass our Holy Father called a rupture, be a Mass of All Ages? We can water down the language, call the TLM the “older form,” but it’s not very intellectually honest. I wrote my letter. I hope it helps. It seems a shame to have come this far down the field, only to have things become pretty muddled at the 5 yard line. As it says, it’s only a translation. There’s no way they can make it sound like Latin texts which are the true beautiful works of the Church. There are a lot of other translations which aren’t perfect. Like it or not, got to live with it, or go to the Latin Mass. By definition, a translation always loses some of the original meaning, as each language has a mind-set, a nuancing of meaning, which is rarely captured by a translation. The fact that we are arguing about a translation is typical of arguments regarding poetry, important novels, or plays in another language, being translated into English. The originals remain distinctly different and moving, such as the original reading of Dante’s Divine Comedy, where much is lost in translation. As to the Sacred Liturgy, we should not be worried if the translation is “awkward” in English, as most of the time, when another language is translated into poetic English, the meanings of the words do change, again, because of the different thinking of the language and the definitions, or even choices of the words themselves. The only way to avoid conflicts is to stick with the original, liturgical language, Latin. Anything else, is less because it is a translation. Although you are a priest, I must disagree with you. We need a language set apart for Liturgical use, not only because of what I have described above, but because we need consistency in the global Church. Translations do not create unity or uniformity of worship.